"I don't have a lot of patience for this 'What are we fighting for?' stuff. We're in a war; a shooting war. We've got to fight, and some of us have got to die." There's been a lot of war movies made throughout cinema history, and maybe that's an understatement. Some are anti-war, some are pro-war, but it is a rare occasion that one can manage to find a balanced, middle-ground to stand on and tell such a masterful story. One such example is the intense drama Twelve O'Clock High, made in 1949 and virtually unequalled since. It stands as a textbook example of tight, flawless filmmaking, as well as a wonderful tribute to those who fought in World War II, even when they were sick of fighting. Set in the early 1940s when the United States was busy waging bombing campaigns on Germany, we meet the members of 918th Bombing Group of the U.S. Air Forces (prior to becoming a separate wing of the military). Although led by a charismatic leader, Keith Davenport (Gary Merrill), they have abysmally low morale and their performance shows it. Brigadier General Frank Savage (Gregory Peck) observes that maybe Davenport's command is weakening because he's burning out on combat, especially the controversial idea of daytime bombings (something unheard of at the time). The authorities decide to relieve Davenport of his command, and they put Savage at the helm instead. From the second he sets foot on the 918th base, he becomes a real "spit-and- polish" commander, insisting everyone follow strict regulations and knuckle-under. At first, Savage is resisted with an onslaught of transfer requests, but eventually the pilots and gunners begin to understand his fury is meant to motivate them into becoming better soldiers. The reasons for fighting the war do not matter, and neither do the doubts of the men; Savage argues that orders are orders and that their duty is to do their best, or else risk the lives of their friends and comrades. Though his methods draw fire from higher-ups, Savage turns the beleaguered 918th Bombing Group into an effective force against German targets. The key here, though, is that this isn't some blindly patriotic movie where the mean commander makes boys into men and wins the day. It's a complex study of leadership and, more importantly, where the line must be drawn between a commander who cares for his men and one who plays at being so tough-as-nails that he risks a mental breakdown. It is this philosophy that drives the film, and ultimately delivers its central message. Although there is some combat in the film (done using stock footage taken from actual bombing missions), this is not an action movie, but rather a careful character study about the relationship between General Savage and his men. Though Gregory Peck is most often remembered as the kindly, wise lawyer, Atticus Finch in To Kill A Mockingbird, without a doubt, Twelve O'Clock High is just as brilliant a performance. Of course here, Peck is the flip-side of his typical character image; he embodies the tough, gritty commander, a role that seems very uncomfortable at first because we're so used to him being the 'nice guy.' He commands his role with total authority, and when he gives his motivational speeches to the pilots, you practically feel the urge to go jump in a B-17 and join in yourself. The brilliance here, however, is that Peck isn't all sound and fury. It is the brief, subtle, quiet moments that define his character and how pressure may indeed be getting to him. I firmly believe that no other typical "tough guy" actor of the age would have been able to deliver this kind of performance. Peck isn't alone though, and the supporting ensemble is just as worthy of praise. Unlike other war films of the time, this one does away with some awkward factors, like purposefully humorous characters or comic relief. Everyone is a real person; no more, no less. There are some clever moments of brief humor, but none of them are at the expense of the plot or overall tone. Clearly the direction here was a thankless task, especially considering 90% of the film takes place in an Army barracks. Henry King makes good use of visuals, however, with some clever angles and subtle camera usage, obviously influenced by a new age of filmmaking. The piece seems years ahead of its time, especially in terms of how the battle sequences were treated, including an impressive, actual plane crash early in the film (which I doubted was real at first), staged just for the scene. All of these elements function very well as a tribute to those who fought in WWII. While the story may be focused on bomber pilots and gunners, it could easily apply to anyone directly working in the war, from doctors to infantry. War may be horrible, but not being able to survive it for lack of confidence or leadership is far worse, and those are the issues examined here. Image Transfer Review: As a 1:33:1, black-and-white image, the film looks extremely good here. Certainly this ranks among one of the best B&W, full-frame transfers I've ever seen. The source print, aside from a few speckles and minor damage (including a short scene with a scratch down the middle), is nicely presented and in astonishing condition for the age. Despite the grainy and murky scenes, there is no pixelization or movement in the backgrounds. The image stays rock solid, with an amount of sharpness and depth that should truly impress fans of the film. Some scenes were a bit dark, but that seems more the fault of cinematography at the time having a hard time with muted scenes. The air-battle segments used stock footage from actual battle cameras, and as such those parts obviously suffer a slight downgrade in image quality. Many scenes, though, could almost pass for a modern day film with modern transfer, were it not for the dated elements giving it away. Audio Transfer Review: The disc has a new stereo audio track, in favor of the original mono. It's a nice track, but nothing very special. For the most part, since the film is primarily dialogue, everything is rooted in the center channel. Some sound effects (like the sounds of planes barreling down the runways) get juiced up into stereo, really coming into the room nicely. There's a lot of directionality depending on the scene, and the air combat portions get a bit wild, but this is not a surround-sound experience. It's merely a nice upgrade of the limitations on the original audio. However, it does show that there's hope for future transfers of older movies to have, at least, some power injected into them. If you don't like the stereo mix, the original mono is included (also in French). It's not as loud or powerful as the stereo, but it's not bad for mono. It holds true to the overall feel of the film, and it isn't particularly harsh or worn-out. 5 Other Trailer(s) featuring The Longest Day, Patton, The Sand Pebbles, The Thin Red Line, Tora! Tora! Tora! Extras Review: There aren't really any features to speak of, other than trailers for other Fox war movies. It would have been nice to see some sort of small featurette, maybe an interview with Gregory Peck, who is always very willing to discuss his work. But this is pretty bare-bones, no doubt about it. The keepcase insert has the chapter listing, and the presentation is decent. All too often we see war movies set aside a certain amount of integrity in favor of providing dazzling action sequences or copious amounts violence, sacrificing some of their value to do so. 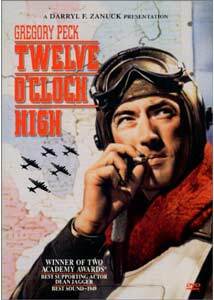 Twelve O'Clock High, however, is the very definition of the word 'integrity', and stands as an outstanding, realistic examination of life behind-the-scenes in WWII and the pressures of military command in an age where technology did not allow for the breed of "fire-and-forget" soldiering we have now. This is precision dramatics at its finest, and must be seen. Highly recommended.